As Jio’s previous announcement already shocked the market when they announced to launch Jio feature phone starting at Rs.999. Now they are going to launch Jio 4G VoLTE phones. An image of Jio’s first VoLTE enables phone has surfaced online. Read the full article to know more details. Update 5 July 2017: Jio may launch its 4G VoLTE feature phone at just Rs 500 only. It is expected that the phone will be launch during its annual meeting on 21st July 2017. Stay tuned with us for more updates. The phone might be available for sale via Jio’s official site, you can follow below steps to book the phone once it is launch officially. Bingo; Jio Rs 500 mobile will be delivered to your home within few days. 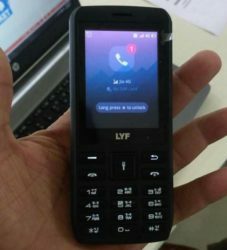 The Jio feature phone has T9 keypad and will not have the touchscreen. Another useful feature is that it also has a button for torch light. As of now, there are no specifications available for this feature phone. There is no information available for specifications like camera, and more. We also still have no information for the maker of the phone. According to the reports, these Jio feature phone will run on the Android operating platform. To enable 4G VoLTE calls in feature phone; enabled by Spreadtrum chips. Also, Jio is in contact with Qualcomm and MediaTek. As we know Jio plans are also cheaper than other; includes free unlimited calling. This Jio 4G mobile will also help people to make free calls. Jio will also be going to announce this news officially soon. So, this Jio 4G feature mobile will cost you Rs 500. Jio is also making two more 4g phones costing Rs.999 and 1,499 respectively. Jio already has about 72 million subscribers as of 31 December 2016. Firstly, Jio offer was only available for LYF phones which helped in LYF smartphones sale a lot. Reports said that LYF sold about 2 million of VoLTE smartphones in less than four months. So, guys, this was Jio 4G feature phone which will be officially launched soon.